Filing your taxes for the first time doesnâ€™t have to be scary â€“ and, in fact, it shouldnâ€™t be. The key to overcoming uncertainty in many situations is educating yourself and being prepared. Following these simple steps will help make filing for the first time a breeze. Before you can file your taxes, youâ€™ll need to have the proper forms. At the very least, this will include a W-2 from each workplace you earned a salary. You may have more than one W-2 if you worked more than one job, or you may have a Form 1099 if you received income from another source. You may also receive other tax forms, such as Form 1098-E if you are paying interest on any student loans. Most tax forms arrive by late January or early February, and you must wait to file until you have all of the proper documentation. Tax credits and deductions are imperative in increasing the amount of your refund (or lowering the amount of taxes you owe). 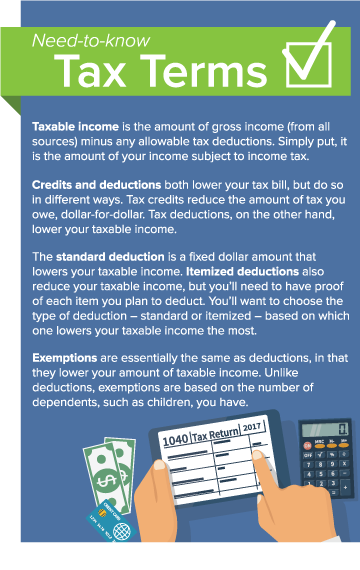 Below are a few credits and deductions you might qualify for. More information for each write-off can be found here. Earned-Income Credit: This credit benefits low- to moderate-income earners by reducing or eliminating the taxes paid. There are income limits depending on the number of dependents you have. Job Search Expenses: While you canâ€™t deduct job search expenses if youâ€™re searching for your first job, you can deduct some expenses if you are looking for a new job within the same field. RÃ©sumÃ© costs, job placement agency fees, travel expenses are some items you may be able to write off. Cost of Moving: If you moved due to a job change or started a new job, you may be eligible to deduct some of the expenses associated with relocating. Lifetime Learning Credit: If youâ€™re paying out of pocket for your college education, you may be able to deduct some of those expenses. Retirement Saverâ€™s Credit: This credit helps low- to moderate-income earners save for retirement. Home Office Deduction: If you work from home on a regular basis, you may be able to write-off some of the expenses associated with your home office based on the percentage of your home used for business activities. Energy-Saving Credits: Qualified energy-saving additions and improvements, such as appliances or adding energy-efficient windows and doors to your home, may earn you a credit on your taxes. Online or in-person: how should you file? For many Americans, filing taxes is free. Online software like TurboTax, H&R Block, and TaxAct are great choices if you feel comfortable taking things into your own hands. These services often guide you through the process step-by-step and can help catch missing information, as well as alert you to credits and deductions you may qualify for based on your individual tax situation. If youâ€™re hesitant to file on your own, consider taking your tax documents to an accountant or other tax preparation office. However, do your research so you donâ€™t fall victim to tax scams â€“ always be wary of tax preparers who base their fees on the size of the refund they can get you. Now that youâ€™ve gotten all your documentation organized, researched tax write-offs, and decided whether to file using online software with the help of a professional, itâ€™s time to actually file your taxes. The deadline to file your taxes, which is set by the IRS, is April 18, 2017. You donâ€™t want to wait until the last minute to file (plus, the sooner you file, the sooner youâ€™ll receive your refund! ), but if there is a situation that will prevent you from meeting the April deadline, you can file for an extension. If you do choose to file for an extension, youâ€™ll need to fill out Form 4868, which will give you an additional six months to file. The extended deadline this year is October 16, 2017. If youâ€™re filing for the first time, donâ€™t wing it. Taxes are a major part of your adult life, and not being prepared could mean losing out on money owed to you or even worse â€“ owing more money to the IRS. Educate yourself and youâ€™ll set yourself up for a healthier financial future.